Body Polish Set: Shea Body Butter & Vanilla Rose Sugar Body Polish. Two of our customer favorites combined in one set for you. This body duo makes for a perfect bath time indulgence and is also a way to pamper someone special. Plus, the combination set is saves you 10% compared to buying the two individually! 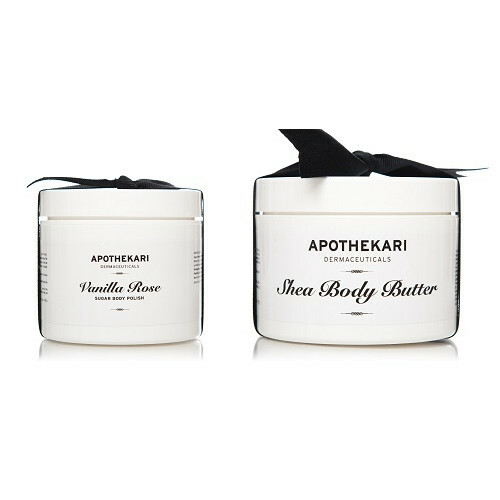 Apothekari Vanilla Rose Sugar Body Polish has a modern and subtle scent of rose plus a faint hint of vanilla and is ideal for aromatherapeutic body treatments or a little pampering in your bath. Unlike most sugar-based scrubs, our body polish is smooth and never drips excess oil, so it’s easy to apply.